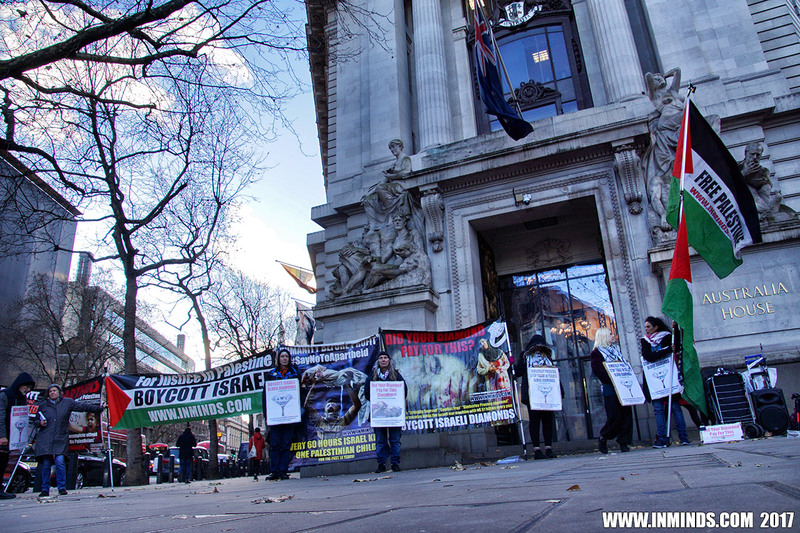 On 8th December 2017, the eve of the Kimberley Process Plenary Meeting in Brisbane, Inminds human rights group held a vigil outside the Australian High Commission in London to ask Australia to fulfil its duty as chair of the Kimberley Process, to stop ignoring the human suffering bankrolled by the trade in cut and polished blood diamonds by rogue regimes like Israel. The Kimberley Process is a self-regulatory process set up to prevent the trade in conflict diamonds that fund human rights violations. 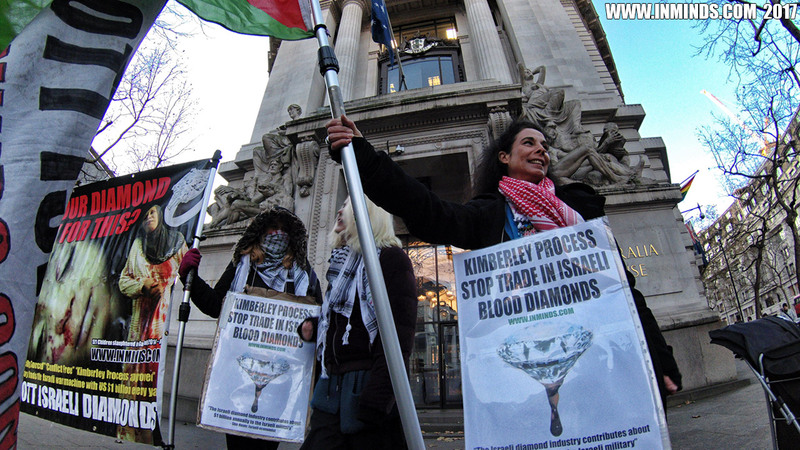 But the Kimberley Process’s narrow definition of a “conflict diamond” as "rough diamonds used by rebel movements or their allies to finance armed conflicts aimed at undermining legitimate governments" excludes cut and polished diamonds, and excludes governments using diamonds to finance human rights abuses. 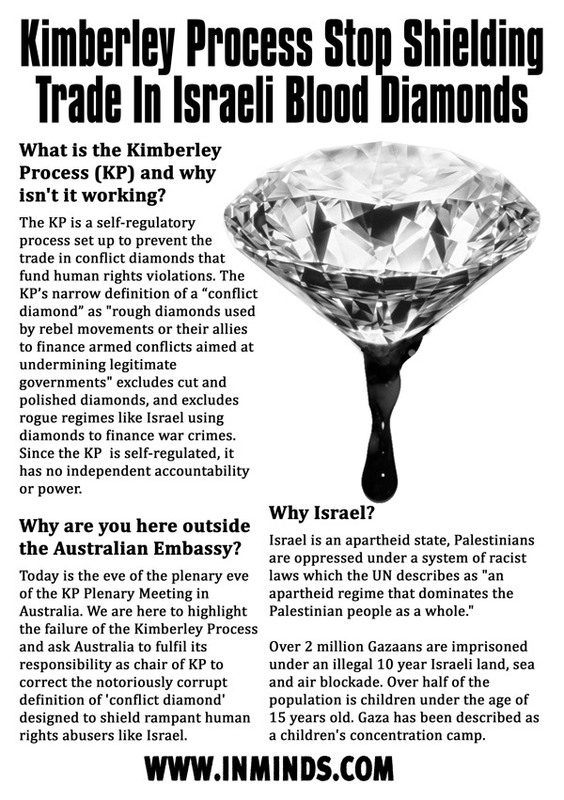 Also, since the Kimberley Process is self-regulated, it has no independent accountability or power. 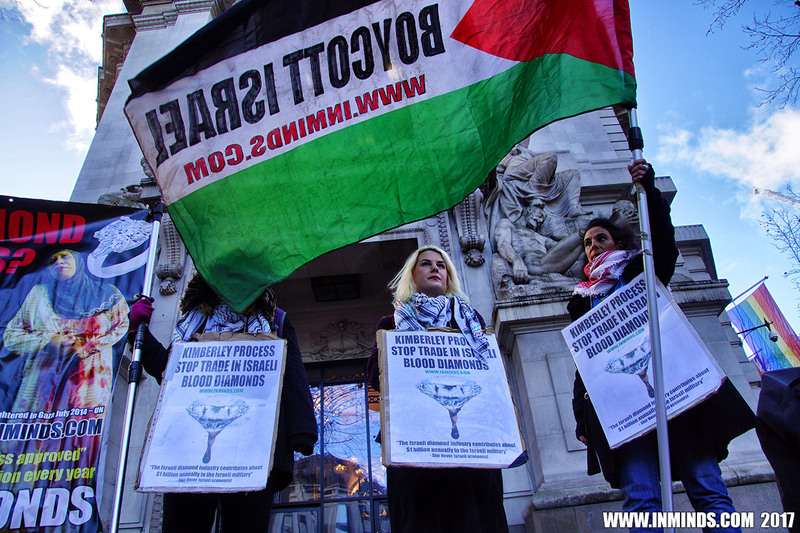 Inminds chair Abbas Ali said "The Kimberley process is a failure. 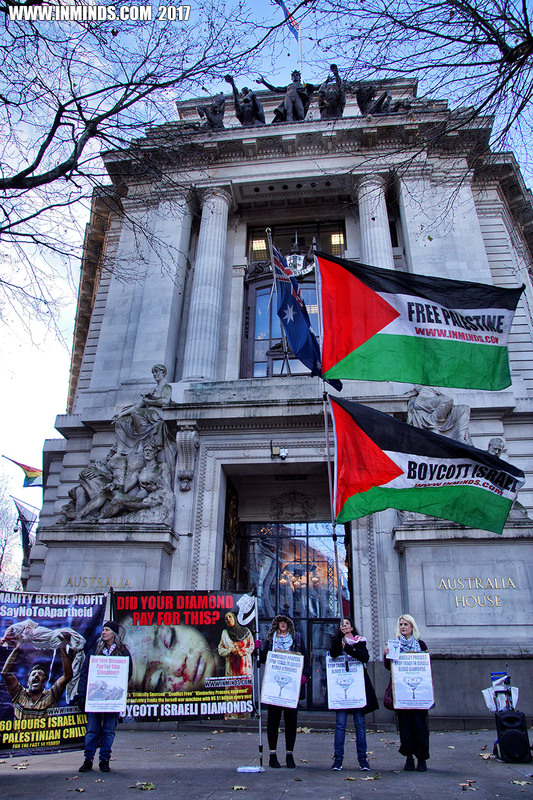 It gives a green light to rogue regimes like Israel to freely trade in blood diamonds to bankroll slaughter in Gaza, and war crimes against the Palestinian people. 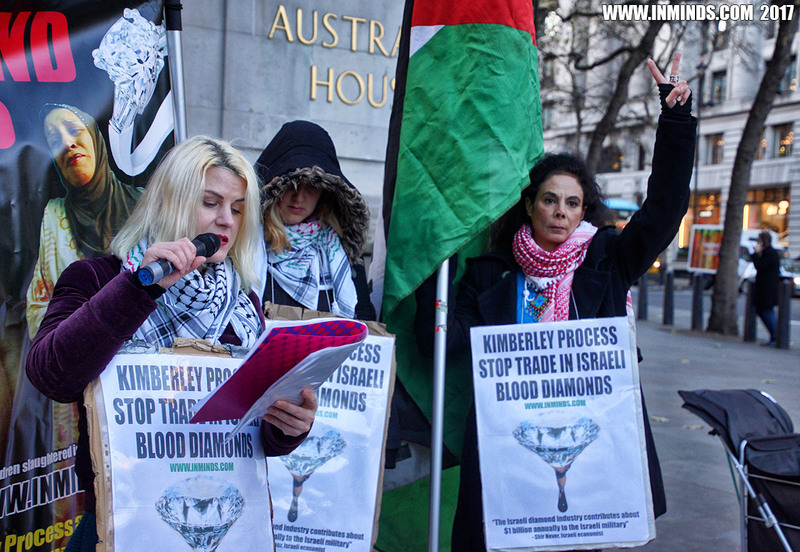 We are here to demand Australia, as chair of the Kimberley Process, not turn a blind eye to this hypocrisy. 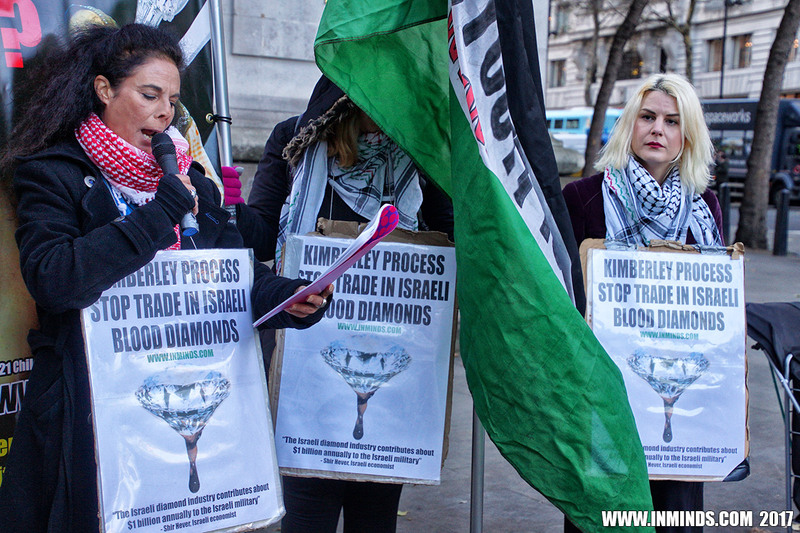 We demand the Kimberley Process stand up to Israel and scrap the castrated definition of "conflict diamond" imposed on it by the Israeli Diamond Bourse!" 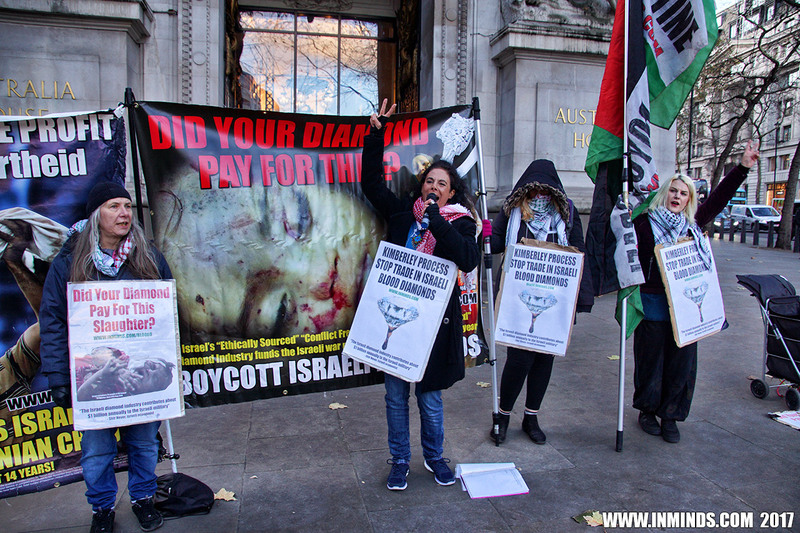 Israel is an apartheid state, Palestinians are oppressed under a system of racist laws which the UN describes as "an apartheid regime that dominates the Palestinian people as a whole." 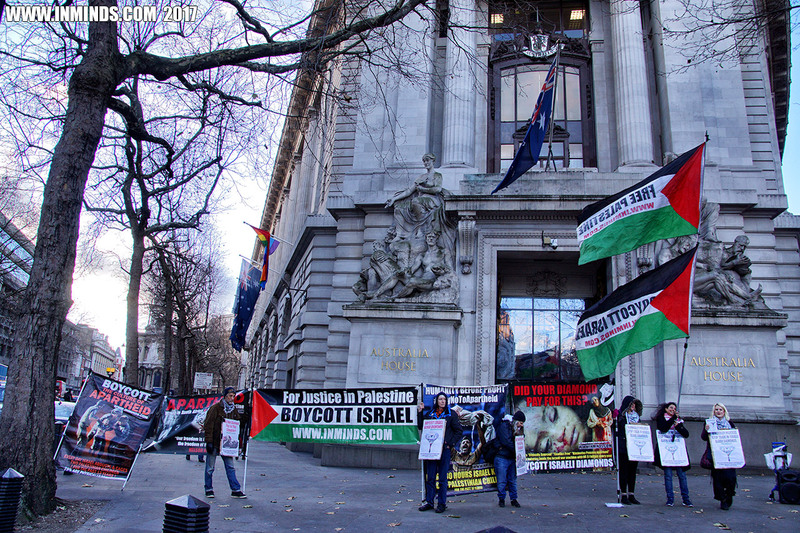 Over 2 million Gazaans are imprisoned under an illegal 10 year Israeli land, sea and air blockade. 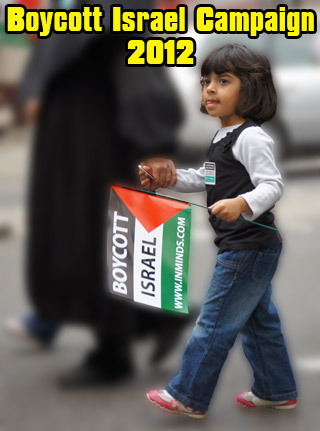 Over half of the population of Gaza is children under the age of 15 years old. 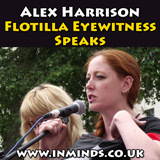 Gaza has been described as a children's concentration camp. Documents from Israel's defence ministry revealed that Israel uses a meticulously calculated cold-blooded calorie count to limit food entering Gaza to enforce a starvation diet on the children of Gaza where they are always starving but not quiet dead from starvation. 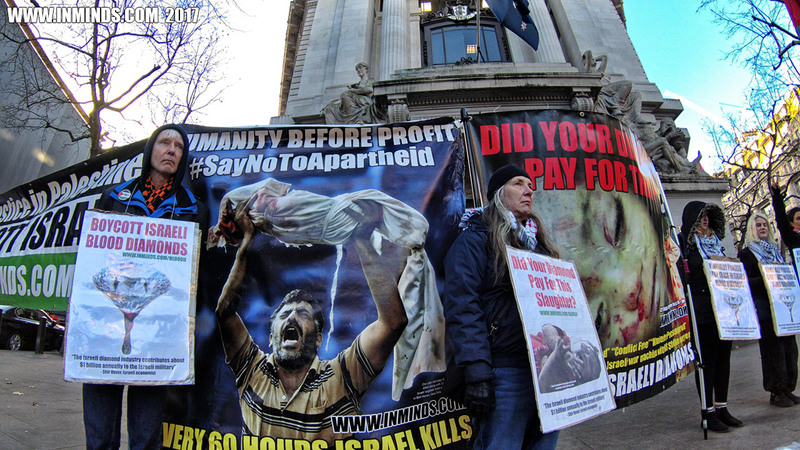 Oxfam reports that 96% of fresh water in Gaza is unfit for human consumption; and the United Nations reports that 72% of the households are food insecure, that by 2020 Gaza will become uninhabitable. 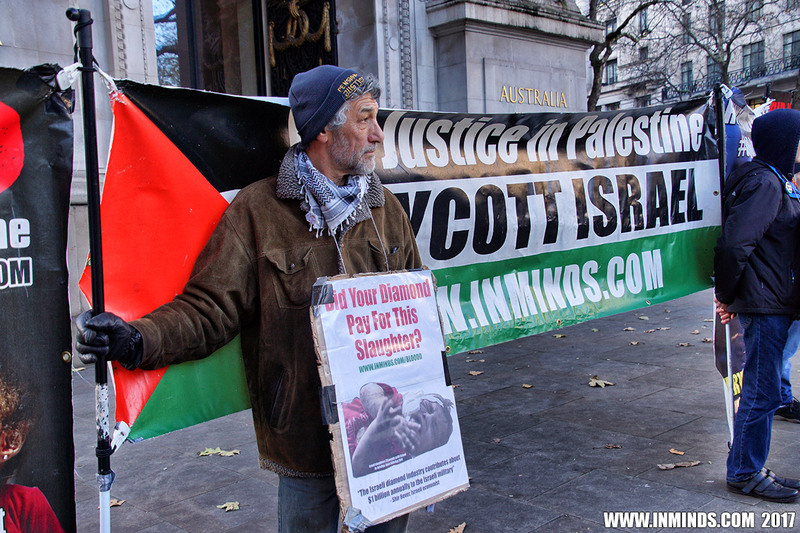 All these human rights abuses are bankrolled by Israel's diamond industry. 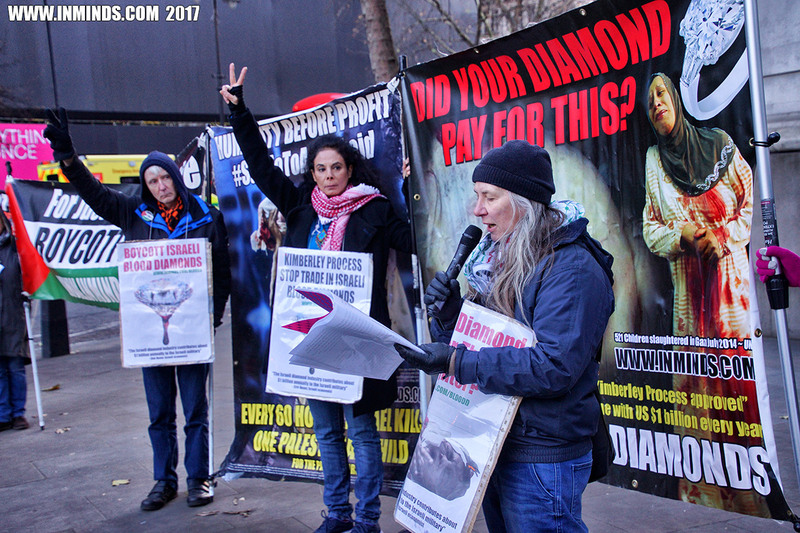 Two years ago at the AGM of the World Diamond Council in Moscow, there was a draft proposal to empower the Kimberley Process by widening the definition of conflict diamonds "to include countries who flout human rights laws not just in mining areas but also in diamond trading centers". 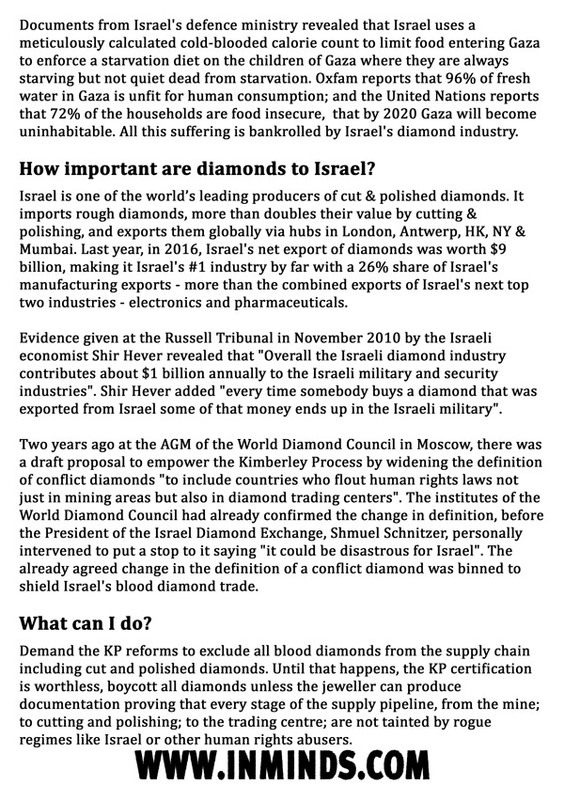 The institutes of the World Diamond Council had already confirmed the change in definition, before the President of the Israel Diamond Exchange, Shmuel Schnitzer, personally intervened to put a stop to it saying "it could be disastrous for Israel". 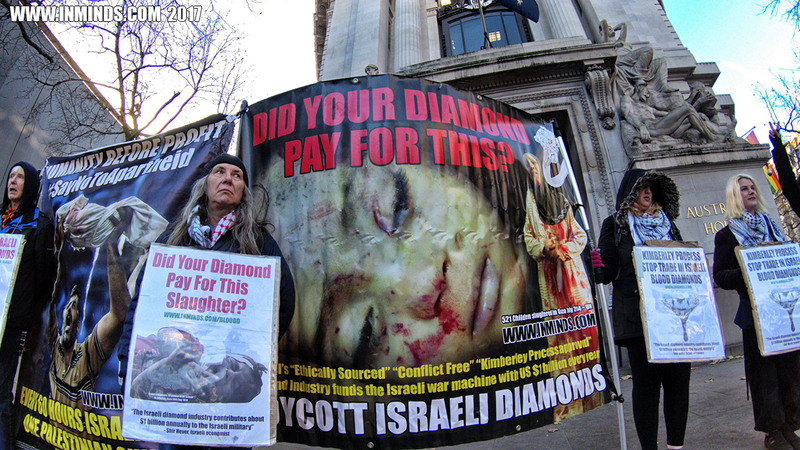 The already agreed change in the definition of a conflict diamond was binned to shield Israel's blood diamond trade. The Foundation’s website boasted of "adopting" a unit of the Givati brigade, of "fostering close relationships with the commanders and their soldiers", of "buying equipment " for them specifically during Operation Cast Lead, that is, during their slaughter of the Samouni family. All references were however deleted from their website once it came to public attention, and soon after BSG was rebranded as Diacore. 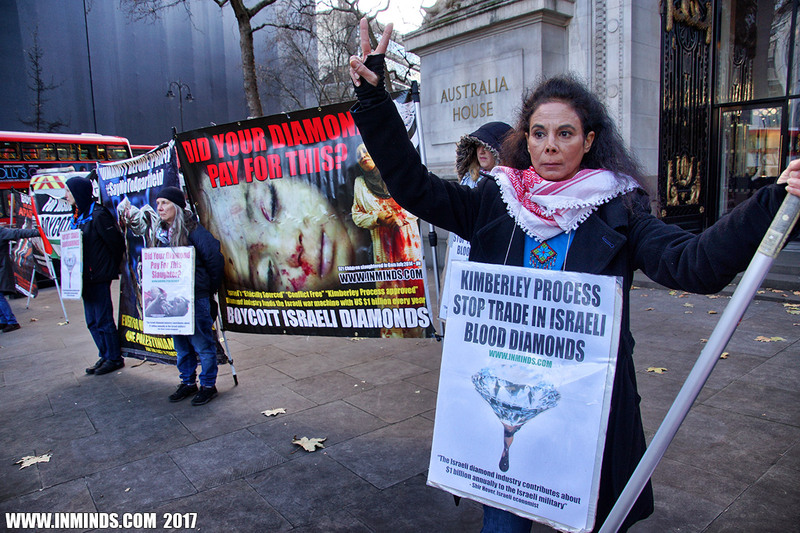 BSG's ( now Diacore’s) blood diamonds are sold on the high street through close partnerships with De Beers's, Tiffany's and Sotherby's Diamonds. 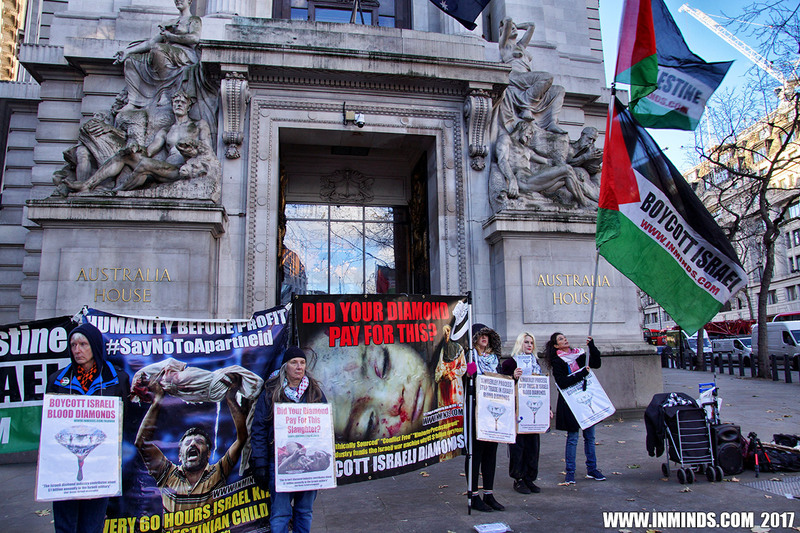 In 2012 the survivors of the Samouni family in a video message asked the Queen to remove De Beer's, Steinmetz crafted, Jubilee Blood Diamond from display at the Tower of London and for the people of the UK to reject diamonds processed by the Steinmetz Diamond company. This lead to six months of protests outside the Tower of London until the Tower indicated that the diamond was no longer on display. 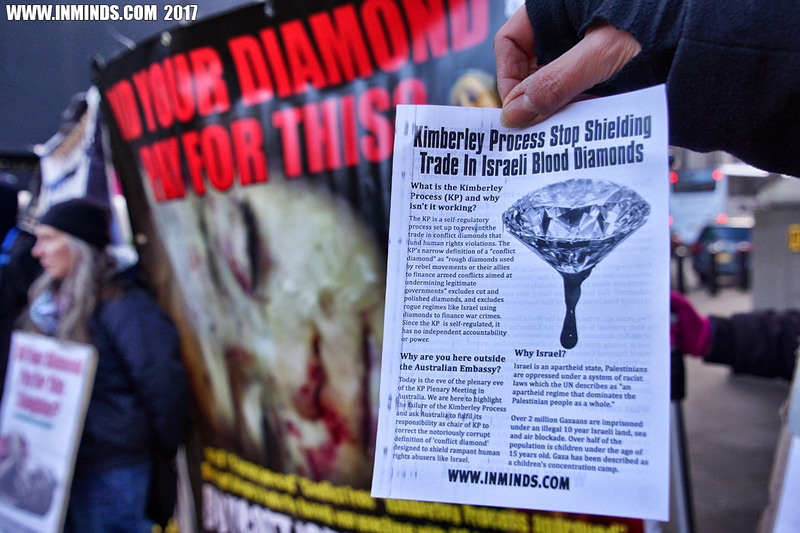 In 2011 Global Witness, the founding force behind establishing the Kimberley Process, resigned from the Kimberley Process arguing that the Kimberley Process had failed to address "the clear links between diamonds, violence and tyranny..” that “ Nearly nine years after the Kimberley Process was launched, the sad truth is that most consumers still cannot be sure where their diamonds come from, nor whether they are financing armed violence or abusive regimes." 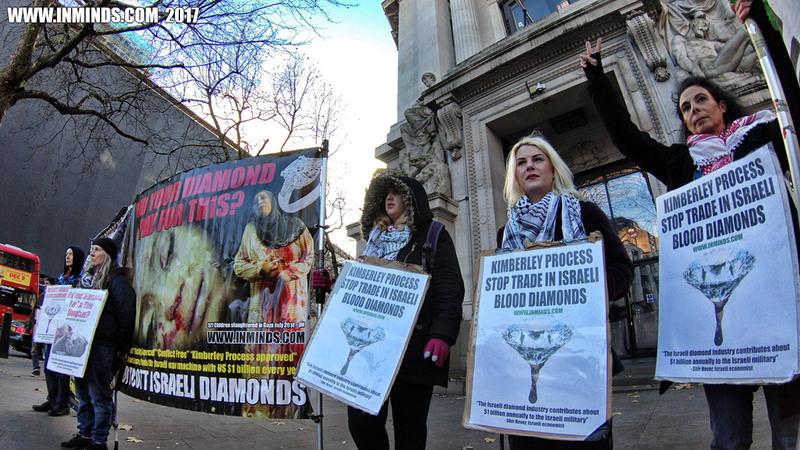 Inminds chair Abbas Ali said "We are here to demand the Kimberley Process be reformed to exclude all blood diamonds from the supply chain including cut and polished diamonds. 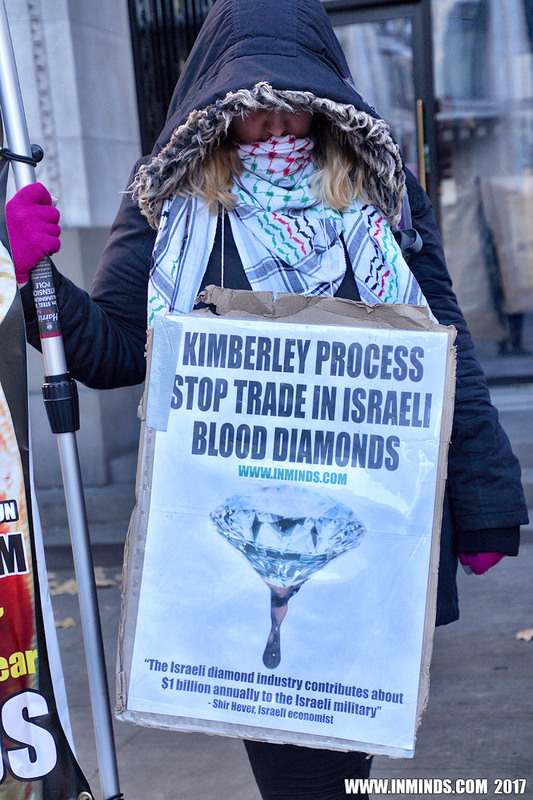 Until that happens, the Kimberley Process certification is worthless, and we urge all people of conscience to boycott all diamonds unless the jeweller can produce documentation proving that every stage of the supply pipeline, from the mine; to cutting and polishing; to the trading centre; are not tainted by rogue regimes like Israel or other human rights abusers."